(The first chapter of my book called, "Granny Godfroy Grows Up." You got to come and get me. Freddy can stay here with Granny Godfroy if he wants to, but you got to come and get me! She has purple hair! P.S. This is what happened our first night at Granny Godfroy’s. Mama had already left to take care of that rich family on Grosse Pointe. She isn’t coming back until next Friday. Me and Freddy sat at Granny Godfroy’s round, splintery wooden table. We looked at each other and Freddy lifted his eyebrow at me, like he always does when he’s saying, “sei la vie, oh well, things could get worse.” They are already as bad as they can get. Me and Freddy had to move out of our nice house in Detroit where I had my own bedroom and doll bed. We had to move to this place called Ecorse. It’s a bunch of wooden houses along the Detroit River. Granny lives in one of those little houses, right next to a marsh. Something called the Depression came to America and it took everybody’s money away. Mama had to go work for a rich family in Grosse Pointe way down the River in the other direction. She can only come home on weekends and Freddy and me have to live with Granny Godfroy. “Who is Granny Godfroy?” I hollered at her when she told us. I could remember a few things about being three, like singing Frere Jacques. The only thing I remembered about Papa was the way he burped after he drank his tea. I looked through our tiny wooden house on Godfrey Street in Detroit. That wasn’t hard to do. We lived in what Mama called a shotgun house. You could stand by the kitchen door and look straight through it. Now all I saw was a bare lonely house with a single scrap of paper huddled in a corner of the parlor. I hugged my doll Pierre up tight against my heart. The parlor furniture was all gone. Mama said she had gotten $60.00 for our horsehair couch and chairs. Mama’s bedroom didn’t have any furniture in it, either, just a pile of blankets where Mama had slept for the past two nights. A wooden table and chairs still stood in our kitchen. Mama said that she agreed to leave the table and chairs there for the new owners. Me and Freddy slept in the other bedroom. We had divided it down the middle with an imaginary line like the equator. My side of the line was empty. Freddy’s had clothes and tinker toys scattered around it. “Freddy, you have to come and clean your side of the bedroom,” I shouted. “I never will,” I said, sobbing and holding Pierre. I looked around, but I didn’t see a horse and buggy and I didn’t see a car. “Are we going to walk to Ecorse?” Freddy asked her. “How can we take the river?” I asked. “Come along, chere, I’ll show you,” Granny Godfroy said. She took my hand, but I let go of her hand right away. She had dirt under her fingernails and she was holding a fishhook. I wanted to wait, but Granny and Freddy wouldn’t let me. They dragged me down to the dock by the river. Someone had abandoned a rickety boat there. A tiny cabin jutted into the air like Freddy sticking out his tongue. The cabin had a crooked window with bed sheet curtains covering it. A rail curved around the deck like a snake and every other shingle on the cabin roof was missing. “What an awful boat,” I said, hugging Pierre tighter. “Thank you. This is the Frere Jacques. Come aboard,” Granny told me. “Wow!” Freddy the traitor said. He down the dock, up the gangplank and got on that Frere Jacques. Granny and I went more slowly. “How do you make it run?” I asked her. Granny moved her arms like Popeye the sailor. “You make it run with muscle power,” she said. “Whose muscle?” I asked her suspiciously. I wanted to know what a sturgeon was but I wouldn’t ask her. I just sat holding Pierre and wishing the trip would be over. I wanted Papa to come and rescue me. I wanted Mama. Instead of telling her that I had never rowed a boat before, I took the oars and put Pierre on my lap. I leaned forward and pulled at the oars. Pierre fell off my lap and the muscles in my shoulders pulled. I got a splinter in my finger and blisters on my hands before we reached Granny’s farm, but I rowed better than Freddy did. After Granny tied the boat up to her dock, I thought I saw her smiling at me, but I looked down at the splinter in my finger and hugged Pierre. I wanted to go home. I pushed them out of his hand. “Nothing here is as good as home,” I shouted. Granny looked thoughtful, but she didn’t yell at me. She pointed up ahead where some apple and pear trees grew next to a log cabin. I hurried to the pear trees. Granny had been telling me the truth. The pears smelled and tasted as good as chocolate ice cream or tootsie rolls, my favorite candy. I stopped long enough from eating two of them to ask Pierre if she wanted a bite, but she took so long to answer I couldn’t wait. I ate those pears. While I munched on pears, Granny took us to the other side of the cabin where there was a fenced in square. Weird noises came from inside the square. I could near them over the sounds of me munching pears. “Harold, be quiet!” Granny shouted. My words ran away from me again around bites of pear. “Who is Harold?” I asked Granny. I wrinkled my nose as we walked by Harold’s pen. “And much smellier too,” I said. I made Freddy go first, but I went in, because there was no room to run away and Pierre was hungry since she hadn’t gotten any of the pears. Granny showed us our rooms. Freddy’s was upstairs in the loft. He had to climb a ladder to get up there, but his bed slats were covered with a fluffy featherbed, feather pillows and three patchwork quilts. A wooden wardrobe stood in the corner. “Open the wardrobe,” Granny said. She had Freddy, but she didn’t have me, not even when we climbed back down the ladder and she opened a store bought door and took us into a room with a doll bed in the corner. “I built that bed especially for Pierre. Why don’t you settle Pierre in her bed,” Granny asked me. I hugged Pierre close to my heart. “She’s not ready for bed. She hasn’t had her supper, yet,” I said. “Well, let’s have supper,” Granny said, leading us into the kitchen. A maple table and chair sat by the window close to the stove. Behind the stove lay a square of cloth, as large as one of Mama’s table cloths. On it laid some smaller squares, like place mats. I pointed to it. “What’s that?” I asked Granny. “In the kitchen?” I asked. “He’s cleaner than a lot of people,” Granny said. “What are you cooking for supper?” Freddy asked. I wrinkled my nose. “I don’t like fish,” I said, kicking Freddy. Freddy didn’t say anything for a minute. I kicked him again. “I don’t like fish either,” he said. “Then I’ll cook you some muskrat,” Granny said. “I don’t like muskrat,” I said. “Sit down. We’ll talk turkey,” Granny Godfroy said. “I don’t like turkey either,” I told her, although it’s my favorite. Granny pointed out a chair. “Sit down,” she said firmly. Me and Freddy sat at Granny Godfroy’s round, splintery wooden table. Freddy raised his eyebrows like question marks. I knew that meant he was wondering about something, maybe about this living with Granny idea. Granny stood at the wood burning kitchen stove, twirling her iron skillet. “What should I cook in this skillet for supper?” she asked. “We could have chocolate mouse,” I said, remembering a picture from Mama’s magazines. “I don’t have any chocolate mice, just plain brown ones, “ Granny said. “We could have black licorice,” Freddy said. “What would you like for supper then?” Granny asked. I looked at Granny’s spiky purple hair and overalls and checked shirt. I closed my eyes and went through my list of favorite foods.. I chose the one that I thought Granny wouldn’t know about. “Spaghetti,” I said. “I see,” Granny said. She threw three tomatoes into the pot of water on the stove. Granny rummaged in the cupboard and took out a bag of sugar and a bottle of vinegar. She threw them into the pot. Then she went inside the pantry and came back carrying a jar of pickles. She handed the jar to Freddy. “Open these please,” she said. Freddy grunted and groaned, but he couldn’t get that jar of pickles open. With one twist, we opened the jar. Granny took it from me and dumped the entire jar of pickles in the spaghetti sauce pan on the stove. “Why did you name your doll Pierre?” she asked me. “That was a thoughtful thing to do,” Granny Godfroy said, dumping four whole tomatoes into the sauce. “You aren’t supposed to put the bag and bottle in the pot. You have to measure out the sugar and vinegar,” I told her. “You don’t have any spaghetti,” Freddy said. “Spaghetti looks like worms,” Freddy said. Granny mixed some flour and water and salt and eggs. With her rolling pin she rolled out the noodles so skinny that they looked like worms. Granny twirled a spaghetti worm around her finger. “Like this?” she asked. I closed my eyes. “I don’t like spaghetti,” I said. “Let me cook it. You might change your mind,” Granny said. Granny stirred and stirred. A tomato-sugar-vinegar smell floated around the room. The spaghetti and sauce cooked inside the pot so energetically that the pot danced back and forth on the stove. Granny danced around stirring it. “Alouette, gentile Alouette,” she sang in time to the pot dancing. That traitor Freddy danced and sang with her. I sat at the table, sniffing the air. The spaghetti smelled good, but I had watched Granny make it, so I wasn’t eating any of it. The pot finally stopped dancing and Granny ladled spaghetti onto the platters. We sat down at the table. Freddy took a ladle bite of his spaghetti. Most of it dribbled down his chin. “Francine, it’s good. Try it!” he shouted. “Mama always tells you not to shout at the table,” I said. “This is Granny’s table,” Freddy said. “Look at her.” I stared at Granny. 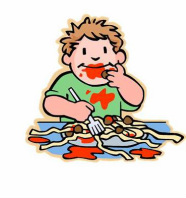 Granny had caught a clump of spaghetti in her ladle spoon and was slurping it into her mouth, noodle by noodle. “Wow Granny! How did you do that?” Freddy asked her. Encouraged, Granny put some spaghetti on Harold’s plate and he slurped right along with her, making a horrible sucking noise. I buried my face in Pierre’s dress. The noise stopped so I looked to see why. Harold had tried to slurp three pieces of spaghetti all at once and they had wound around his nose and mouth and chin so tightly that he couldn’t open his mouth. Laughing, Granny rescued him and the noise started up again. I wish Granny hadn’t rescued him. “Francine, aren’t you going to finish your spaghetti?” Granny asked me. I looked down at Pierre and smoothed her dress. “Pierre’s tired. She’ s ready to go to bed,” I told Granny. “How long have you had Harold?” Freddy asked her. He looked so comfortable leaning back against those snow white pillows with the patchwork quilts tucked up to his chin. I wanted to pull them off him. I would have done it too, if Granny had gone downstairs. “Can I go to my room?” I asked. “Come along, Francine.” Granny Godfroy picked up a kerosene lamp and climbed back down the loft ladder and I followed her. Looking down at the top of her head made me feel like I was lost in a meadow of purple grass. Granny led me to door behind the kitchen stove. She grabbed my hand and pulled me into a tiny room. I blinked. The room was painted a bright pink, the kind of pink you see in a sunrise. Even the curtains at the windows were pink. A pink patchwork quilt was spread over the bed. Granny lifted up the quilt. Underneath it was a pink feather bed and the pillows were also pink. “Took me a lot of dying Granny said, but you were worth it, Francine. I started working on it as soon as I found out you were coming to stay with me. She pulled open the door of the wooden wardrobe that stood in the corner. She threw me a flannel nightgown, pink of course, and a pink bathrobe. “Quick, put these on and we’ll go back up into Freddy’s room and finish the story,” she said. My stomach jumped like a frog at the thought, but to keep from answering Granny, I pulled on the night gown and robe. I grabbed Pierre and stood in the middle of the braided rug beside the bed. “I want to go to my own home,” I said. I headed back toward the loft ladder without answering her. This time I climbed in front of her so I wouldn’t have to feel like I was drowning in a sea of purple grass. Freddy was sitting up in bed waiting for us. “Are you going to tell us a story about Harold?” Freddy said as soon as we came into his room. “No, we can stand here,” I said. (Here is the rest of the story.